Topic 20: ALARP concept and health and safety of personel, equipments and the work environment. Friends or foe. Discuss the concept of ALARP as it relates to health and safety of personels, equipments and the work environs. Permalink Submitted by Mykola Mamykin on Wed, 2012-10-10 21:21. ALARP is the key concept used in UK for the Risk Management which arises from UK Health and Safety at Work etc. Act 1974. This is not to say that other countries do not use it, but it is most likely called “good engineering practice”. The risk is considered As Low As Reasonably Practicable when it is possible to demonstrate that the cost involved in reducing the risk further would be grossly disproportionate to the benefit gained, and therefore ALARP is common practice of judgment of the balance of risk and societal benefit. To determine if risk is ALARP cost-benefit analysis should be made to compare the risk assessed with the money, time and efforts needed to mitigate it. ALARP can be considered as an attribute of goal-setting legislation versus prescriptive one and in former the duty holder (say, employer) is responsible to demonstrate to the regulator that the risk to the personnel is ALARP. I would definitely say that ALARP principle is the “Friend” of safety and risk management. Permalink Submitted by Aaron McKenna on Wed, 2012-10-10 22:15.
involved (i.e. the probability of the hazard occurring)? Permalink Submitted by oseghale lucas ... on Thu, 2012-10-11 02:37. Thank you very much Aaron and mykola for your wealth of contribution to ALARPBefore we continue this debate further, let’s have an understanding of where the ALARP concept originated: ALARP history was dated back to the mining legislation of the 1870s. From where it was then brought into the Factories Act and then passed on into the Health and Safety at Work Act of 1974. It was not until after the Second World War that this expression obtained the status of a major principle in safety legislation. Lord Justice Asquith in Edwards v NCB (1949) the concept originator said: "Reasonably practicable' is a narrower term than 'physically possible' and seems to me to imply that a computation must be made by the owner, in which the quantum of risk is placed on one scale, and the sacrifice involved in the measures necessary for averting the risk (whether in money, time or trouble) is placed in the other; and that if it be shown that there is a gross disproportion between them - risk being insignificant in relation to the sacrifice – the defendants discharge the onus on them. Moreover, this computation falls to be made by the owner at a point of time anterior to the accident" From this expression we could denote that the risk is considered As Low As Reasonably Practicable (ALARP) when it is possible to demonstrate that the cost involved in reducing the risk further would be grossly disproportionate to the benefit gained. On this point I agree with mykola. Aaron I agree to disagree with you that ALARP is much more about the cost involved in safety measures because it’s obvious that it is a common practice of judgment of the balance of risk and societal benefit, although the risk involved is quantified in terms of cost, time etc. It should be noted that is for the balance of risk and societal benefit. A more proactive approach to risk management than a reactive one in a typical work environs. Aaron you could through more light on your point for further clearity. Now, from Lord Justice Asquith in Edwards definition he cited that “Reasonably practicable' is a narrower term than 'physically possible'”. Can someone through more light on this. Permalink Submitted by Toby Stephen on Thu, 2012-10-11 06:57. Aaron raises a very interesting issue on whether monetary value is placed on human life and/or injuries. Although the justice system in industrial nations considers human life to be 'priceless', I don't think that this is the way the world operates. From a statistical perspective, it's a necessity to estimate the value of life in order to judge whether a certain safety regulation is cost effective. This feeds into the ALARP argument and Mykola's point about the balance of risk and societal benefit. Nobody wants to accept that they're a 'statistic' but ultimately it's a pre-requisite for cost-benefit analysis. In the US for example this is estimated at approximately $5 million per person, and if a safety code will cost more than this for each person it will save then "regulators eyes start to glaze over, they say it is too expensive" . Permalink Submitted by Menelaos Michelakis on Thu, 2012-10-11 13:05. I agree with Toby Stephen's statement, and i wish to make a simple example : ''Nobody wants to accept that they are a statistic but ultimately it is a pre-requisite for cost benefit analyses''.The example is very simple and the solution is easy to guess, i just added a few more numbers to make it interesting. Example : Safety of workers - ALARP, here it means, to reduce the risk of an accident, as much as possible, with a series of logic actions. As an engineer i will try to use numbers. Having worked in a quarry for a couple of months, i shall set the following example : Let's suppose that i am engineer in a quarry and i have to take care of 400 workers. Every worker must be protected as good as possible, and the company must pay for the proper equipment. Each worker must wear (obligatory) : 1. Specially designed helmet (20£), 2. Crude boots (20£), 3. Crude gloves (14£). Safety can be increased further by wearing : 4. Specially designed jackets (35£), 5. Specially designed trousers (65£). The above items need to be replaced every year. If a worker wears all items safety is increased 100%. If a worker wears jeans (company pays nothing), instead of specially designed trousers, safety is increased 1% instead of 5%. So safety of the uniform is 96% instead of 100%. The question here is : '' Is it reasonable for the company, just for a 0.04 increase in safety to may more than a 100,000£ over the next 4 years '' ? ( I am sure that each worker would prefer the specially designed trousers !!). To summarize : ALARP, is a quality term. As engineers we ought to use numbers, and this is why i set the above example, which - by the way - is completely out of my mind , but what would you do as company (engineer), and what would you request as a worker ? Permalink Submitted by Aaron McKenna on Fri, 2012-10-12 08:42. Permalink Submitted by Mykola Mamykin on Thu, 2012-10-11 22:46. Excellent points be Toby Stephen and M. Michelakis on using numbers while approaching safety. And in general - what do you guys think about prescriptive legislation? My $0.02: there is no way it could be completely avoided and goal-setting regulatory framework used instead. - Cementing an oil well. Before Macondo accident, Operators needed to convince MMS that their procedures are safe ALARP. After explosion - BOEMRE (no more MMS) issued several prescriptive recommendations on the subjects, like borehole to be at least 3 inches bigger then the casing, two mechanical barriers etc. - In Shipping, International Maritime Organization promotes Safety at Sea through various Conventions like SOLAS, MARPOL etc. They use wording like "this and this to be safe as far as practicable". All concerned parties subsequently enquire: "well, what exactly does it mean?". Then IMO, through its subcommittee like MSC or through IACS will issue Unified Interpretations saying: "this and this shall be 450mm from that and that". In these cases - prescriptive wins. Permalink Submitted by Aaron McKenna on Fri, 2012-10-12 08:38. I wish to respond to a few points made by Mykola regarding his favour towards prescriptive legislation. Since every facility and system is unique (i.e. never have exactly the same location, specifications, measurements etc.) if we were to revert to purely prescriptive legislation this would potentially entail an independent regulator visiting each site and setting specific regulations for each and every component. This case by case regulation is obviously not viable. I understand that using goal setting legislation the safety requirements are essentially made by the company and therefore may differ from another facility in which that specific risk may have been considered greater or less. It must be remembered that in current society companies are driven by the need to make safe facilities in fear of the backlash they would receive, if an incident did occur due to negligence or ignorance of a risk, in the hope of cutting corners. These decisions also need to be validated by evidence proving that they have/had reduced the risk to ALARP. As presented in lectures this allows new technologies and improvements to be facilitated without the complete overhaul of the legislation. Thus I tend to disagree that prescriptive legislation is the complete answer. Permalink Submitted by Mykola Mamykin on Mon, 2012-10-15 20:15. Never ment to say I am in personal favour of presecriptive legislation. I provided a couple of examples, showcasing the fact that it can not be in all circumstances replaced by goal-setting. Permalink Submitted by michael saiki on Wed, 2012-10-17 16:00. To contribute to what you all are saying, sure there can't be one single perspective or instrument/document that can completely define the requirment of safety and as we have historically seen that man pushes himself further to minimize the risks and optimize safety as previous safety templates fail, it is therefore certain from scholarly perspectives and experience that both the Prescriptive and Safety case models in isolation cannot be effective. Permalink Submitted by Aaron McKenna on Wed, 2012-10-17 17:17. Permalink Submitted by JOHN BOSCO ALIG... on Tue, 2012-10-16 16:13.
fatalities that could be caused. benefits or not because it is hard to value a human being. Permalink Submitted by Elvis.E.Osung on Wed, 2012-11-14 10:52. @ Johnson i aggree with you, There is some form of ambiguity associated with the ALARP concept, measuring efforts towards safety against invested resources is quite biased and subjective. When decisions are subjective, there is usually no standard of measurement. Subjective decisions are prone to private interpretations, arguments and litigations. Safety considerations should be properly spelt out without room for ambiguity. ALARP has tendency of exposing humans to some levels of risk as long as organisations can demonstrate in finances that efforts have been made to control the risk. This approach is not as proactive as expected. This brings us to the issue of the value placed on a human life. i dont think cost should be a yard stick for accessing ALARP. Permalink Submitted by oseghale lucas ... on Tue, 2012-10-16 18:28. Permalink Submitted by oseghale lucas ... on Tue, 2012-10-16 18:52. Permalink Submitted by SON CHANGHWAN on Sun, 2012-10-21 07:08. Permalink Submitted by Frixos Karletides on Thu, 2012-10-18 19:47.
project and individual risks can be managed. Permalink Submitted by Andrew Allan on Fri, 2012-10-19 04:38. Perhaps the most important time in the lifecycle of a facility with respect to risk reduction and ALARP is at the Conceptual Design stage. Often, insufficient attention is paid to ALARP principles at this stage of the project as the Project Manager focusses on cost/schedule in order to convince operators and joint venture partners that the project is profitable and worth progressing. Also, at this early stage there is often no dedicated safety engineering resource embedded in the project team. By far the greatest reduction in risk can be brought about at this stage as you select the fundamental concept for the project. The role of a safety engineer at this phase of a project should be to guide the project team towards a design which minimises personnel exposure, reduces hazardous inventories/pressures/temperatures, reduces operational and maintenance requirements etc so that the risk to personnel is minimised. Consider the potential risk reduction which can be realised by implementing the measures above, compared with Menelaos example of whether or not to purchase personnel protective equipment for people working at a site. It is also more easier and more cost effective to implement risk reduction measures at this phase rather than convincing owners to make modifications to a site which is already in operation. Permalink Submitted by Andrew Allan on Fri, 2012-10-19 04:51. - Brownfield modifications to an existing platfrom to install new riser reception and dedicated process facilities. The platform is 25 years old and already very congested. - Install a new bridge linked platform connected to the platform above, this will house all of the facilities needed to recieve and process the gas from the new field. - The brownfield option increases congestion on the existing platform and will introduce new fire and explosion events which may impair the temporary refuge. The weight of the new facilities will take the structural load on the jacket to its limits and may require structural mods. Explosion risk will increase due to greater congestion. But it is by far the least expensive. - A Bridge linked platform allows the new facilites to be separated from the existing platfrom temporary refuge. Design and layout of the new facilities can be optimised as they don't have to squeeze into available space on the existing platform. Latest technologies and best practises can be easily applied. This is twice the cost of the brownfield option. - An FPSO allows greater flexibility and the opportunity to tie back other fields in the area, purchase or hire of an existing FPSO would mean modifying the vessel. This is of comparable cost to the BLP. Which would you choose? Do you agree there is a greater scope for reducing risks at this stage compared with making amendments to the design during detailed design/operational phase? Permalink Submitted by Aaron McKenna on Fri, 2012-10-19 09:16. You make some excellent points here Andrew and I wish to agree with your thoughts regarding safety at the design stage. I also believe that safety must be considered as early as possible since this allows greater flexibility in modifications, because quite obviously construction has not begun. Ultimately then this gives us a much better handle and control on the mitigation of possible risks. i.e. simply put, we can mould the design to make it safer. These relate very much to some of the views of Professor Moan who spoke at the LRET talk on Thursday evening. This then allows us to address known risks. I believe the trouble sometimes in implementing this completely in the past has been that at the design stage the risks, as is the facility, are not physically apparent and therefore perhaps not as clear. However, with current technology we should have the techniques and methods in place to manage these risks at the earliest possible time- the design phase. With regards to the scenario you provided, my immediate response would be to go with the BLP since this would offer you the best flexibility, allowing you to have the most control over the process. Whilst this is twice the price of the brownfield option the risk reductions would be worth this cost, in my opinion (however that is without quantifying the actual scenario). I feel it also beats the hire of the FPSO since that too requires modifications which would suggest your options are somewhat limited to the current configuration of the FPSO. Permalink Submitted by Mark Nicol on Fri, 2012-10-19 19:16.
structural design would be required to establish the feasibility of the option. end of field life the decommissioning costs will be significantly reduced. Permalink Submitted by Kareem Saheed Remi on Fri, 2012-10-19 20:52.
high cost associated As Low As Reasonably Practicable. Permalink Submitted by Kareem Saheed Remi on Fri, 2012-10-19 21:23.
but in most cases it should not go below what regulatory standards state. estimate of ‘acceptable risk’ has to be made. Permalink Submitted by nina yari on Sat, 2012-10-20 00:53. From my point of view this is the best topic here since by reading my classmate's post(especially first ones which are in the style of a debate), I perceived the concept of ALARP.Now, I want to elaborate on this issue by discussing a graph. As you see in the graph,5 systems of risk control are available. The fist and second one are not applicable because the risk levels are above the tolerable level.The levels of risk at third and fourth one are tolerable.But with a small cost, we can reduce the risk(5th one).But in the sixth one we can see that for reducing the risk the cost rises sharply.In other words for mitigating a low percentage of risk level we should pay alot which isnot reasonably practicible. So we should reduce the risk to the level which is ALARP which is the 5th system of risk level control. Not 6th and not 4th. Permalink Submitted by nina yari on Sat, 2012-10-20 01:08. I'm in trouble how to insert a jpeg or a word document(my graph) here. I apologize fot this but I could not attach the diagram to my post.Please let me know if anybody knows how to insert. I will insert the picture later. Permalink Submitted by Henry Tan on Sun, 2012-11-04 19:02. Email me the figure, and I may be able to help. Permalink Submitted by oseghale lucas ... on Tue, 2012-10-23 21:44. Thank you very much for your various contributions on ALARP.Nina so sorry for that, use the attach picture icon on your chat. Having understood the concept of ALARP with much debate.Can we discuss the difference between AS LOW AS REASONABLE PRACTICABLE (ALARP) and SO FAR AS REASONABLE PRACTISABLE (SFARP). These two terms used by the HSE especially in the UK seems contradictory. Lets argue for or against. Permalink Submitted by Mykola Mamykin on Thu, 2012-10-25 20:19. A great lecture was delivered by J. Munro last Tuesday. He talked about prescriptive and goal-setting legislation, SFAIRP and ALARP and demonstrated “moving down the ALARP” triangle. - If I heard right, he mentioned that in Offshore industry (in UK) the cost of reducing a fatality, when it starts to be considered a “grossly disproportionate” is around 67Mil pounds?! No doubt UK legislative regime is considered world’s best and serves as a prototype for other countries. - He mentioned several times that SFAIRP and ALARP are virtually the same in the intended purposes, which is of course logical. He also mentioned that once in ALARP area of triangle, a company would stop throwing money into risk reduction under ALARP principle but would probably go further under SFAIRP principle. So the latter is stricter? Permalink Submitted by Aaron McKenna on Fri, 2012-10-26 21:51.
very much what Munro said. perspectives, again, means that they are not interchangeable. same” and yet require quite different approaches to risk management? Having said that..... Although it is intriguing to understand the difference, I do feel that maybe we are getting too caught up in this ALARP vs SFAIRP debate. If HSE say they are effectively the same, surely that is a good enough understanding at this stage. Permalink Submitted by Tony Morgan on Wed, 2012-11-14 20:01. Does anyone have examples of SFAIRP ? being different from ALARP? as although i agree that they are sujective and can be interpreted differently depending on the time of review as noted previously......i really cannot see any difference in the INTENT. As also noted - one being in the language of law and the other being a more recognised term by the engineering community. that as long as the risk is low and cost to mitigate high then no case to answer! suggesting that the original proposition which is more in line with ALARP is no longer considered correct and cost and efforts are not be considered thereby leaving the door open to potential prosecution and a real concern over the subjectiveness of the issue....i can only presume that in current or most recent legislation where ALARP is applied that we have moved back to a balance between the costs and efforts in relation to the risk presumably i would say based around the breadth of technology available and the emphasis being rightly based upon the assessment of the risk and the drive to make it LOW. The LOW is still subjective but various fairly common levels are generally used / accepted for Risk scoring to get the concerns into the LOW risk areas. the concepts of gross disproportion, precautionary principle and tolerable risk are considered as useful in the DUTY HOLDER demonstrating and evidencing his process for ALARP, RISK review, Good practice and engineering judgement being effective. It is clear that a RISK MANAGEMENT PROCESS is required to provide a holistic approach to design and technical safety management throughout a project or facility and that this demonstration by many various means is the only real way of avoiding potential prosecution in the event of an unlikely or unprobable event. In summary i guess we are back onto CONTINIOUS IMPROVEMENT in RISK MANAGEMENT. Permalink Submitted by Tony Morgan on Wed, 2012-11-14 17:37. Permalink Submitted by c.ejimuda on Mon, 2012-10-29 12:44. ALARPS or SFAIRP principle is friendly because before considering an operation safe from major accident hazard, the dutyholder/operator should be able to demonstrate that its operation, installation, personnel onboard, systems in place and activities are carried out As Low As Reasonably Practicable (ALARP). This can be achieved by the use of good engineering practices, Quantitative Risk Assessment (QRA) and Qualitative Risk Assessment. For further demonstration of the ALARP principles especially when further reduction of risk to ALARP cannot be assessed by engineering judgement, the dutyholder/operator will carry out a Cost Benefit Analysis using QRA techniques to demonstrate that the cost of reducing the risk is reasonable or gross disproportionate. One important thing about the CBA in term of the ALARP principles is that it aids dutyholder/operator during decision making process especially when engineering principle fails. Permalink Submitted by Ajay.Kale on Fri, 2012-11-02 04:27. As low as reasonably practicable (or ALARP) is a phrase commonly used to indicate the balancing of cost and value. Risks always have to be reduced to a level that is tolerable, and then to ALARP. ALARP is demonstrated by showing alternatives have been considered and further risk reductions are impracticable or the costs are grossly disproportionate to the improvements gained. This means you always have to demonstrate the next lower risk option is "unreasonable." Options first have to be screened for minimum acceptance criteria, such as legislative requirements. This precedes the ALARP decision. The question is not about whether the option is reasonable but whether it is permitted at all. Only after checking against such minimum acceptance criteria can the discussion about ALARP and tolerability take place. Permalink Submitted by Monday Michael on Sat, 2012-11-03 06:14. 3. Moderation- limit the effect of hazardous materials by using the least hazardous forms of the materials. 4. Simplification- the design of the process, equipment and procedures should be such that eliminates sources of error or complexity and also eliminates the likelihood of occurrence an undesirable event. Usually all of these four principles can be applied more effectively at either conceptual or FEED design phases. The principle of Simplification relates more to the example given by Andrew Allan but all 4 principles can be applied in one way or the other to most engineering processes/systems. Permalink Submitted by Kingsley ENEM on Tue, 2012-11-06 05:42. The term ALARP (As Low as Reasonably Practicable Risk) is the word used by regulators and company to provide a basis for deciding on the level of investment needed for safety programs. The term emanated from UK legislation, mainly the health and safety at work ACT 1974, which obliges "provision and maintenance of plant and systems of work that are, so for as is reasonably practicable, safe and without risks to health. A risk is simply ALARP once it is demonstrated that all risk reduction possibilities have been weighed, and those that are not grossly disproportionate have been adopted. The concept of "ALARP" is sometimes used for setting a value for acceptable risk. The basic idea behind this concept is that risk should be reduced to a level that is as low as possible without requiring excessive investment. Engineering standards, and other professional documents, can make available guidance. Nevertheless, at the close of the period, the manager has a risk-based decision to make. That decision denotes that the manager have in their mind certain value for the level of acceptable risk that they are agreeable to accept. Permalink Submitted by Elle Allswell David on Tue, 2012-11-06 19:59.
increasing the number and effectiveness of controls. will be safer and sustained for future. Permalink Submitted by uosaigbovo on Thu, 2012-11-08 02:57. ALARP means as low as resonably possible. This concept has been applied extensively today in the safety culture of the oil and Gas industry. This concept is aimed at reducing the frequency of accident by proactive measures. For example in radiation use, companies like Schlumberger apply the ALARP concept by using three main concepts: 1. Distance 2. Time of exposure 3. Shielding. The company ensures that employees are trained in radiation safety and ensures that any employee working with radioactive materials apply these three concept. This practice has helped the employees working with radioactive materials maintained minimal doses of radiation, thus removing side effects from working with radioactive materials. Also, Exxonmobil introduced its dropped object campaign in Nigeria as there were worrying trends in objects falling from heights with potential to harm people or even injuring people at the wellsite. The campaign involved hazard hunt of potential drop objects, enlightenment of personnel to stop the job when there is a potential drop object around the working area. For Exxonmobil in ngieria, the dropped object campain has been able reduce frequency of dropped object. The ALARP concept is a safety friend that has been used as a measure to reduce accidents in the oil and gas industry and statistically has shown as a viable tool that can be used to set measures that will improve the safety culture of the oil and gas industry. Permalink Submitted by Charles Stuart on Wed, 2012-11-14 05:40. I guess one of the main issues with ALARP is that by its very nature it’s subjective and will relate to the values of the person or organisation implementing the control measure (e.g. As mentioned previously, what is the value of a human life?). Say a company assesses the cost of a life (or fatality) at £1m, and then by applying the ALARP principle, safety measures which could prevent the fatality costing £2m won’t be implemented. If the regulator (e.g. HSE) then disagrees with the company’s subjective analysis and decides to impose a fine of £4m after an accident, then the control measure is now worth implementing. This highlights a fundamental difficulty as the process becomes circular and self referential. Also terms such as; ‘best available technology’, ‘best operations’ or ‘high standards’ are ambiguous and open to interpretation. Is the ‘best available technology’ the technology which is capable of reducing the risk to the ALARP level? I think a compromise needs to be made so that ALARP can be used in conjunction with prescriptive legislation, and it seems that this is the case in reference to the HSE guidance notes on Offshore Safety Standards which cites PFEER r.17 and r.19 as falling outside the scope of ALARP (1). Permalink Submitted by Neil Fraser Jam... on Wed, 2012-11-14 11:52. I agree with Charles Stuart. Permalink Submitted by Andreas Kokkinos on Wed, 2012-11-14 15:57.
order to reduce a possible risk or even eliminating it entirely. that we expect or forecast. ALARP concepts. Friend or foe. Permalink Submitted by Azeezat on Sat, 2012-11-17 13:29.
risk can be considered to be friendly. Permalink Submitted by Giorgos Hadjiel... on Mon, 2012-11-19 09:20.
would be grossly disproportionate to the benefit gained. the employer’s decision will ensure that their design theory will reduce risks. Permalink Submitted by Igwe Veronica I... on Tue, 2012-11-20 01:31.
there is no absolute safety. is undertaken only if a benefit is desired. Permalink Submitted by Leziga Bakor on Wed, 2012-11-28 22:15. In my opinion, the ALARP concept and health and safety of personnel, equipment and the work environment are friends. The ALARP concept ensures that the risk is reduce to as low as possible so far as the cost of its reduction is proportional to the reduction. This makes the work environment and the personnel relatively safe. However it does not guarantee total safety from associated risks but it reduces the risk and it consequence. This is a positive step and that’s why I say it is a friend. If the ALARP concept was not there, some risks will be left at a very high level and put the personnel and their environment at great risk. The best scenario is that the risk be totally eliminated but this is not always possible as total elimination of the risk might cost so much more than the whole business can generate and it would make the business not to be economically viable. This will in turn make the company loose profit and the personnel lose their job. Thus ALARP helps us operate in the safest possible way where the company can make profit, operate in the best achievable way friendly to the environment and the employees keep their jobs with minimum risk to health and safety. In conclusion I would see ALARP as a friend to the personnel in terms of their health and safety, the equipment and the environment. Permalink Submitted by Ekaterina Pavli... on Sun, 2012-12-02 01:28. As has been well discussed above, within the Oil and Gas Industry, 'as low as reasonably practicable' (ALARP) arguments are used to support either acceptance or rejection of policies or procedures that would result in changes between high and target risk considerations. But what hasn’t been clearly presented is that when considering ALARP, there is an action called ‘cost benefit analyses’ or CBA that has to be undertaken first. In his post Ejimuda Chukwumaijem comments on this and I’d like to take this further, CBA is used to determine if further risk reduction is ‘reasonably practical’, what that means is all risk reductions are a good thing unless the costs are considered ‘disproportionate’. To allow this to be determined there is a formula that’s applied: The Costs of implementing the risk reduction are divided by the cost that would be seen by the benefit. To be given the green light the answer has to be greater than what is called a ‘Disproportion Factor’, this is a value that’s worked out in assessing the risk, obviously the greater the risk the higher the value. It must be kept in mind that CBA is not on its own a justification for ALARP, but a tool to support. In HSE we use CBA to ensure that the full costs have been considered for implementing the risk, not only installation, commissioning and training, but also the production losses associated with a potential shutdown. For assessing the benefits we would look at reduced operational and maintenance costs for example, but this goes further to include the reduction of potential health hazards all which have their associated cost savings. ALARP is a good tool and should be supported in its use in considering whether to proceed with new risk reduction policies. Permalink Submitted by Mark Haley on Sun, 2012-12-09 15:45. I would like to add to Ekaterina's comment on CBA. The link at the bottom of this post gives some advice from the HSE on CBA vs ALARP and raises some very good points about the use of CBA. As Ekaterina says CBA is a useful tool for helping decide what is ALARP, but it must not be the sole argument for ALARP and must not be a replacement for good practice and proved standards. There are a number of major issues with CBA in that it is still extremely objective. There is no official guidance from the HSE on when costs become grossly disproportionate as every situation is dealt with on a case by case basis. So how are risk managers supposed to know when costs become grossly disproportionate?? The HSE discusses that the higher the risk the higher the degree of disproportion when considering the CBA. The HSE quotes some figures used by the Nuclear Safety Directorate (NSD) as an example, which vary from a factor of 2 to 10 depending on the risk involved. However one thing that can be done to help make a decision when calculating your CBA is to carry out a sensitivity analysis. Those of us on the project management course will be aware of this. Because the possible fatalities/injuries or possible risk outcomes may not be fully known it is important to vary your inputs to see how the CBA outcome is affected for a variety of different scenarios. This is particularly relevant when proving that further measures are not reasonably practical. Permalink Submitted by Oluwatadegbe Ad... on Sun, 2012-12-02 12:15. The termn"safe system" may be a reference to either absolute safety or to acceptable safety. As soon as a system is determined to be safety-critical, absolute safety may become an impossible target. either justifies more effort or demands a different approach. acceptable, and the remaining which are acceptable provided that they have been reduced to as low as reasonably practicable and where the cost of reducing the risk further is not justified by the improvement to safety. Not all safety standards specify an acceptable level of safety, focusing more on how to ensure and assure that an acceptable level of safety has been achieved. Permalink Submitted by Oluwatadegbe Ad... on Sun, 2012-12-02 12:20. Some myths or fallacies about what ALARP means have grown up over the years. Here we explain what some of these myths are and, why they are wrong. Fallacy 1 - Ensuring that risks are reduced ALARP means that we have to raise standards continually. what is ALARP will also be affected by changes in knowledge about the size or nature of the risk presented by a hazard. If there is sound evidence to show that a hazard presents significantly greater risks than previously thought, then of course we should press for stronger controls to tackle the new situation. However, if the evidence shows the hazard presents significantly lesser risks than previously thought, then we should accept a relaxation in control provided the new arrangements ensure the risks are ALARP. Fallacy 2 - If a few employers have adopted a high standard of risk control, that standard is ALARP. standard to one which is accepted as ALARP. Fallacy 3 - Ensuring that risks are reduced ALARP means that we can insist on all possible risk controls. ALARP does not mean that every measure that could possibly be taken (however theoretical) to reduce risk must be taken. Sometimes, there is more than one way of controlling a risk. These controls can be thought of as barriers that prevent the risk being realized and there is a temptation to require more and more of these protective barriers, to reduce the risk as low as possible. You must remember that ALARP means that a barrier can be required only if its introduction does not involve grossly disproportionate cost. Fallacy 4 - Ensuring that risks are reduced ALARP means that there will be no accidents or ill-health. ALARP does not represent zero risk. We have to expect the risk arising from a hazard to be realized sometimes, and so for harm to occur, even though the risk is ALARP. This is an uncomfortable thought for many people, but it is inescapable. Of course we should strive to make sure that duty-holders reduce and maintain the risks ALARP, and we should never be complacent but, nevertheless, we have to accept that risk from an activity can never be entirely eliminated unless the activity is stopped. Permalink Submitted by amir masoud bayat on Tue, 2012-12-04 17:25. The term Safe System can be a source to either absolute safety or to acceptable safety. If a system is tough to be safety-critical, absolute safety probably become an impossible goal. The main idea of As Low As Reasonably Practicable (ALARP) represent the thought that acceptability may be impacted by the cost of improving safety. 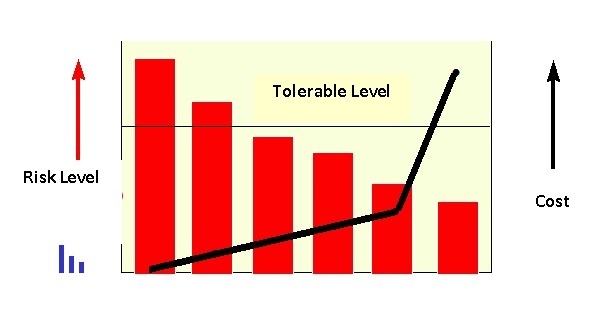 Therefore, it should be into one of the three possibility of assessment of risk category: those which have little a risk are always acceptable and those which have so great a risk are never acceptable and the rest of risks which are acceptable represent that they have been decreased to (ALARP) where the price of decreasing the risk is not justified in the improvement to safety. Permalink Submitted by Mohamed H. Metwally on Sat, 2012-12-08 15:24. Permalink Submitted by Abiaziem Davidson on Sun, 2012-12-09 00:33. ALARP is defined as "as low as reasonably practicable" the principle is that the residual risk shall be as low as reasonably practicable. It is a measure to reducing risks. For a risk to be ALARP, it has to demonstrate that the cost involved in reducing the risk further would be grossly unequal to the benefit gained. ALARP involves the application of time, effort and money in reducing a risk to zero. ALARP is not a prescriptive form of safety it empowers organisation/employers to write their own rules and implement it. ALARP implies that employers should predict risk and put into practice all the preventive measures to check-mate the risk. To ensure that risk is reduced in an organisation, ALARP means that we have to raise standards continuously, adopted a high standard of risk control and there will be no accidents and ill health. ALARP originated from UK legislation (Health and Safety at Work Act 1974) which requires "provision and maintenance of plant and systems of work that are so far reasonable practicable, safe and without risks to health.As there is no absolute safety in any industrial activity, ALARP ensures needed standards for reducing risks are adopted and reviewed whenever there is change in operation. ALARP is a friend to personnel safety, health and the environment; it tends to protect personnel from occupational accidents by reducing the risk involved in the operation to as low as reasonable practicable.It is a friendly tool to stakeholders in deciding whether to invest in a new business or not; stakeholders tend to back out from project with high risk involved and invest in a business with its risk as low as reasonable practicable. Permalink Submitted by Tilak Suresh Kumar on Sun, 2012-12-09 20:33.
reduce the risk to an acceptable level – in other words to ALARP level. move away from ALARP towards a continuous risk reduction models. Permalink Submitted by Yaw Akyampon Bo... on Mon, 2012-12-10 21:16.
risk. The concept of ALARP is thus introduced. approach. A barrier or safety guard on a machine reduces the impact of failure. safety and ALARP standards as those provided by the latter. this is also the main aim of setting up a business. vigilance also for the latter. Permalink Submitted by Mehran Vakil on Mon, 2012-12-10 21:22. ALARP is a kind of risk assessment method. Using this method, the risks are taken into consideration from difficulty, timing and also price aspects. Hence, after making decision the risk might be reduced, provided that the mitigation activity makes sense, whether from timing or from money point of view (risk assessment, 2012). Personally speaking, the two main prominent factors for big companies and organizations are investment and reputation. However, if they are faced to a kind of risk which is highly considerable but it might be happened seldom, they do not cope with this type of risk. Obviously, it is not reasonable for them to put lots of money and time for mitigating these risks which are happened rarely. For instance, the life time of a worker is important, but if he is exposure to a situation that may cause hazards for him/her once in a blue moon, it wouldn’t be economical for an organization for decreasing in the probability of a hazard. It will not ruin its reputation and history due to its number. It also will not waste money in order to controlling a rare event. ASSESSMENT, R. 2012. ALARP [Online]. Available: http://www.risk-assessments.org/alarp.html#.UMM6juSIGns [Accessed 8/12 2012]. Permalink Submitted by Parry James on Tue, 2012-12-11 03:16. ALARP” as low as reasonably possible. measures and spend the minimum required and not improve safety performance. Permalink Submitted by Mark Haley on Tue, 2012-12-11 05:55. How do you know when you have done enough?? The HSE give some good advice on their website as to what they class ‘as low as reasonably practical' and also talk about SFIARP. However, as far as the HSE is concerned the terms ALARP and SFIARP are interchangeable, and it is only when drafting legal documents that you need to be specific on the term you use. We know that the use of ALARP is a good concept in that it allows the HSE to set goals rather than rafts of prescriptive legislation. However, on the negative side, the use of goals rather than specific laws means that the HSE has to use judgement to decide when enough is enough and that can be subjective! So how does the HSE judge when enough is enough? Cost Benefit Analysis is one method and is a particularly useful approach in analysing ALARP when you have a new design of you are doing something that has not been done before and for comparing sacrifice vs risk. However, the in the majority of cases the HSE decides ALARP on best practice. Health & Safety is a continually improving process and within any industry there are industry leaders which demonstrate the best practice. It is the practices of these companies that the HSE use as the benchmark to decide what is best. Does that mean that the companies that have the highest standards set the benchmark for everyone else? This is a trap that some companies fall into. Best practice does not mean the most expensive or the highest health and safety practice. Some businesses set their standards higher than best practice for publicity reasons or because they feel more socially responsible. The goal of achieving best practice is not the most expensive way of achieving health and safety it is the smartest way. More often than not the best measures for reducing risk are through education and changing simple human practices. These measures are generally extremely cheap and tend to be the most effective. Like perhaps, not using a unicycle to move around in a meat factory full of sharp hooks might be one measure! Permalink Submitted by Manuel Maldonado on Tue, 2012-12-11 06:39. Reducing risk as low as reasonable practicably can become an issue to safety and integrity of installations in the oil industry when the human factor unconsciously used perceptions rather than good understanding and analysis. Although some of the risky operations can be performed under good risks assessments and controls in place, there always be a room for a failure or an accident or incident when ALARP philosophy is not exercise properly. ALARP can be used aimed at performing activities which allow continuous production but always being dominated by ensuring no body is going to be hurt or the integrity of facilities is not going to be threatened. ALARP is not the permission for taking short cuts to safety nor an excuse for perfoming activities where safety cannot be guaranteed. Therefore, very effective risk assessments must be developed as team work execises to ensure different perceptions are taking into account and all risks are covered and managed with good controls.